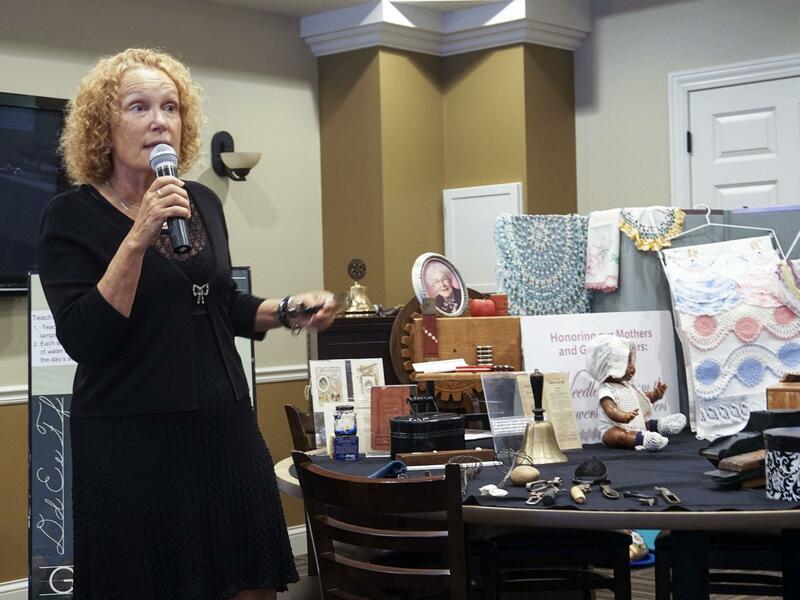 Rotary File for August 22, 2017 | Rotary Club of Iowa City A.M.
Doris E Montag spoke about "Find Your Passion" in Retirement at the August 22 meeting. Small awards were given out to Casey Cook for leading the Grants Committee to a selection of three projects to support with our $5000 community grants distribution this fall, and to Deb Ockenfels for bringing in so much food to our side for the Crisis Center Food Fight in July. Sara Sedlacek from the IC Noon Club awarded the club the coveted golden turkey trophy for bringing in the most food during the Food Fight. Phil Peterson collected on our behalf checks of $116 and $135 respectively from the Iowa City and Coralville Stuff consignment stores for the rummage we have contributed through those stores. There is a new and improved can sorting process and we are again recruiting for volunteers at both the Coralville and Iowa City locations. See Mark Patton to sign up. The next club social/fundraising event will be Sept 14 at Val Martin's home for a French Dinner. The cost will be $25 per person. Casey Cook brought some of the IA MOST smoked salmon for members to try today at breakfast. If you like it, pick some up next year at the IA MOST fundraiser. Flags were exchanged between AM Club and our exchange student, Paul Mompio Martinez for her club and district flags. In the News: Nancy Pacha concerning the school board vote. Many happy bucks: Mark Patton for being able to take a ride in John Ockenfel's biplane during the Air Show; Deb PVA on showing sheep at the fair; Rachel Marquardt for her family becoming a century farm family at the State Fair; Nancy Pacha for the produce that members of our club contributed to the Crisis Center; Liz Nichols, Paul Ellis, Pat Schnack, Deb Galbraith, Mike O'Leary and others for seeing (or not seeing) the eclipse; Jack Tank for his 39th anniversary; and several others. Doris Montag has been doing special theme displays in the form of traveling programs since she retired from the UIHC about 18 months ago. She suggests that people plan a second career doing what they are passionate about once they retire from the day job. Loss of creativity in our jobs is often the cause of burnout. Our second careers should put that creativity back into our lives. Montag calls her retirement gig "The History of Ordinary Things" told in traveling exhibits and storytelling. Topics of these popup exhibits have been as different as needlework to old farm implements and kitchen implements. A school house collection from the early 1900s from Montag's mother formed the basis of one exhibit. One of her most recent exhibits was "Raising Chickens in the 1900's." Montag recommends for those about to go into retirement: 1. Plan 2. Find a creative endeavor. 3. Try a little of it out. Continually ask yourself, "Is my life in expansion or contraction?" If it is in contraction do something about it.